Before businesses can reap benefits from IoT, IT leaders must create a solid technical foundation. The Internet of Things may be among today’s most hyped technologies, but that’s not stopping some large enterprises from seeing positive results from early implementations. One example is Avnet, the $27.9 billion technology distributor that launched IoT in its global data center to better manage ambient temperatures and energy consumption. The combination of sensors and software continuously monitors temperatures and adjusts thermostats when necessary to stay within preset thresholds. Closer energy monitoring, along with new generations of energy-efficient IT equipment, helped Avnet avoid the $8 million in capital investments it had been contemplating to upgrade its power capacity, Phillips adds. 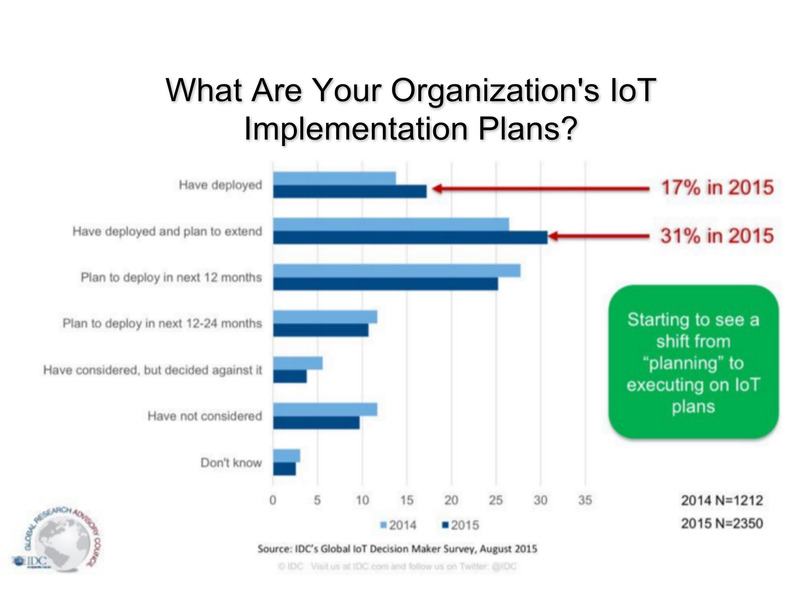 Avnet isn’t the only enterprise taking the IoT plunge. IDC estimates that revenue in the sector could jump to $1.7 trillion in 2020 from $656 billion in 2014. But before these megagrowth trends materialize, IT planners must face a stark reality: Flashy new applications can’t deliver quantifiable business benefits unless enterprises first create a reliable, secure IT infrastructure to support hundreds or thousands of IoT endpoints and the tide of data they generate. That means embracing new IT architectures and, in some cases, investments in either cloud or on-premises enhancements to networking, computing, storage, and analytics resources. Fortunately, IT managers have greater choices than ever when selecting and implementing foundational technology tailored for IoT. The following five fundamental considerations can help promote IoT success. There isn’t a one-size-fits-all design template for IoT, and that’s good news. IT leaders can take advantage of three main options for their unique business needs. The first is to simply tap into existing networking, computing, and storage resources, a choice Avnet was able to make after it installed numerous sensors to collect temperature data. “Handling network traffic isn’t a challenge when it’s within the data center,” Avnet’s Phillips says. To learn more about IoT and its impact on IT, attend the Internet of Things Summit at Interop Las Vegas this spring. Don't miss out! Register now for Interop, May 2-6, and receive $200 off. IoT implementations that send high-volume data streams over greater physical distances may benefit from a second architectural approach, known as edge computing. With this strategy, designers enable information processing near where data is being collected, often with the help of intelligent gateways. These devices perform initial filtering and analyses that separate actionable information from raw data feeds and then send higher-value results to central applications and databases. The result is less network traffic and more efficient use of storage capacities, says Peter Christy, research director at 451 Research. But edge computing alone isn’t always practical, creating a need in some cases for a third architectural approach: public cloud or a hybrid of private and public cloud implementations. For example, clouds enable “data lakes,” off-site data stores paired with advanced analytics applications that glean detailed insights from information. “Some analytics algorithms are too resource-intensive to run at the edge and instead need server and storage space in a data center,” says Alex Glaser, a director at Harbor Research. Architectural choices will help determine the volume of IoT traffic and how far it needs to travel for subsequent processing. From there, IT managers can choose the right mix of networking capabilities. Wireline networks are pervasive and offer a secure, ready-to-use option for industrial IoT applications running in data centers, shop floors, and warehouses. “If you have an industrial plant with a wired connection to your corporate network, that’s a great way to go,” Christy says. Similarly, existing enterprise WiFi networks may reliably support some IoT implementations. But the longer-transmission ranges of some IoT applications, as well as battery-consumption considerations for endpoint devices, are pushing planners to consider additional options. Traditional 3G and 4G cellular technology offers extensive coverage, high data rates, and low latency, making it a solid choice for connecting dispersed industrial machinery and sensors. But cellular’s relative high cost and battery-draining “always-on” characteristics can be an IoT roadblock. “Cellular technology will typically be used where data can’t be transmitted in some other, more cost-effective way,” Christy says.